It’s February – the month of love and you will LOVE the February Close to My Heart specials. Sunny Thoughts: February’s Stamp of the Month is an exclusive D sized stamp set featuring 13 images. You can pick up this stamp set at full price or at a discounted rate with a qualifying purchase. Pretty In Pink: You will be thinking pink all month long with the Pretty in Pink special! During February, you can celebrate what matters most with a select group of pink and gold items available at 25% off the retail price and three exclusive product bundles available at 30% off the retail price. 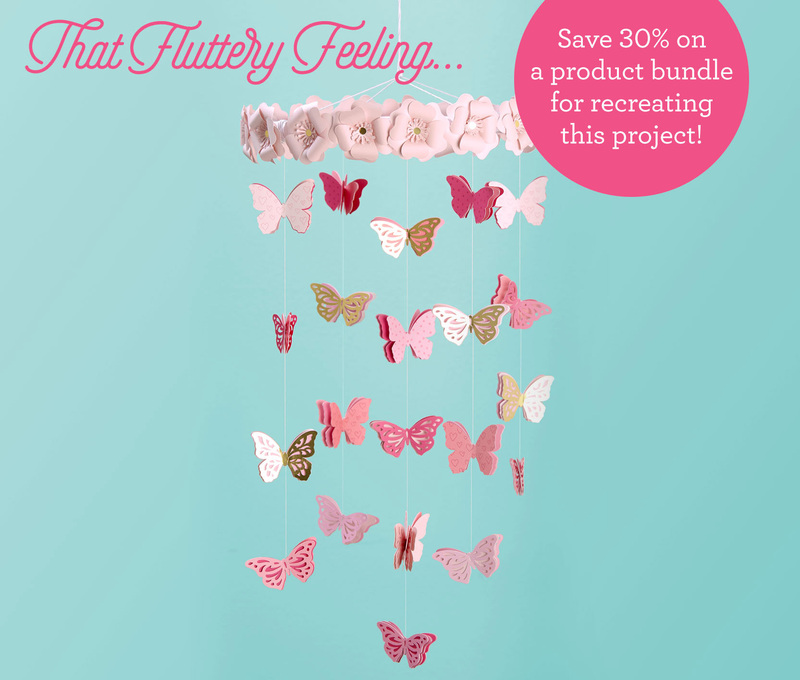 These bundles include the Bashful — Color of the Year bundle and two bundles with supplies to make the Butterfly Mobile Papercrafting Project. For Hostesses: When you host a party that reaches the third level of Hostess Rewards or higher (submitting your party order no later than March 5, 2018), you’ll receive a FREE Color of the Year bundle — that’s a $36.30 value, totally free! For New Consultants: Anyone who becomes a Close To My Heart Consultant in February will receive a FREE Color of the Year bundle in their New Consultant Kit — $36.30 value, totally FREE! I’d love to have you be a part of my team. Designer Travel: I am so excited about the new organizational line Designer Travel. Last month when I attended my weekend retreat I saw this organizational system in person and I was in awe. What seemed like a black hole of storage actually was organized. I have a few favorite pieces and what’s even better as a Hostess you can earn this bundle for 50% off. Let’s set a date and have a party. Happy November! I want to start by saying thank you to my loyal customers and followers…without you there would be no reason for me to keep my blog alive. I love sharing my artwork and reading your comments so a big thank you – you truly bless my life. I really can’t believe that November is already here. Close to My Heart sure does not disappoint with the specials this month. Through the Year: Get this set of 28 for just $5.00 with a qualifying purchase during the month of November. It’s going to work perfectly for the upcoming December Special which I’ll be giving you sneak peeks of real soon! Just for Fun: November is the perfect time to restock your crafting essentials like paper, ribbon, die cuts and stickers during our Just for Fun Sale! You can save up to 40% on bundles or 30% off individual items. Visit the monthly specials link on my business page http://www.papercraftingprincess.ctmh.com for more information or feel free to contact me on my Facebook Page Papercrafting Princess. Remember this is also the perfect time to fill out your Close to My Heart wish list and give your family my number and I will make sure you get just what you want on Christmas morning. I will also gift wrap for free! Thanks for stopping by…I look forward to sharing more with you in November. I didn’t think the Punny Pals stamp set could get any cuter, but with the new matching thin cuts in the October Share A Smile card they are 13 times cuter! That’s one thin cut for each cute little critter! My card is 4X4 and I first cut a circle before running it through the Alphabet Embossing folder. I added a piece of B&T behind the circle cut out and then popped up the front panel with 3D Foam tape. I added my die cut and colored animals with some Thin 3D Foam tape. I think this would make a perfect baby card, birthday card or just a happy hello to share a smile. Don’t miss out on the Share a Smile card kit…it’s just $39.95 while supplies last. Welcome to October…can you believe we’ve already made it to the 10th month of the year? October is a busy month for me…most of the activity centers around our annual Pumpkin Carving Party. We enjoy hosting parties here at our house so adding one more in the fall seemed like just the thing to do. I’ve also added a new class to my lineup – Monday Mayhem – I’ll describe it more later. Christmas Tunes – This set of 7 stamps will have you humming along while creating your Christmas cards this month. The exclusive “D” sized stamp set is yours for just $5 with a qualifying purchase during the month of October. card kit! The card kit includes the dies, card bases, envelopes, paper, and step-by-step instructions for creating 32 cards, and it is available at a discounted price! Create these delightful cards and use them to share smiles all around! Round Up Matching – With every order you have the opportunity to “round up” and donate to Operation Smile, but the month of October is Special because Close to My Heart will match those Round Up Donations up to 10,000. I am really hoping that ALL of my customers will choose to participate in the Round Up and help me increase my Operation Smile Donation thermometer. If you have any questions on how you can help feel free to leave a comment on my blog or e-mail me. I am around 1/4 of the way to my annual goal of funding at least one smile. Sign up and prepay for both Just the Basics and Falling for You card classes for just $25, that’s a $5 savings. If you’re schedule changes last minute your card kit will be available for pick up at your convenience. Monday Morning Mayhem: Grab your Workshop Your Way Kits or other Close to My Heart products and join me for some crafting mayhem. Space is limited to 6 and you MUST RSVP. This is a FREE non-instructional craft time. Donation to Operation Smile would be appreciated. Please only Close to My Heart Products. Although this is a non-instructional time I will be available to answer questions and some limited product will be available for purchase.